Pros: Excellent filtration, it makes the hit SUPER smooth. Really well made, easy to clean, love it! Cons: Adds a little bit of drag. 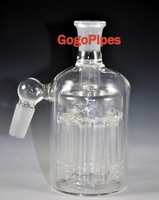 Fits really snug with the downstem and makes removing it sometimes difficult. Comments: No water comes through when pulling, no reason to remove it really. Just pull the bowl. Its awesome. Comments: its alot larger than i had anticipated. Cons: need occasional refilling, though that's hardly a con.